Celebrating his 6th year at The Mirage, Terry Fator is one of Las Vegas’ most beloved entertainers. 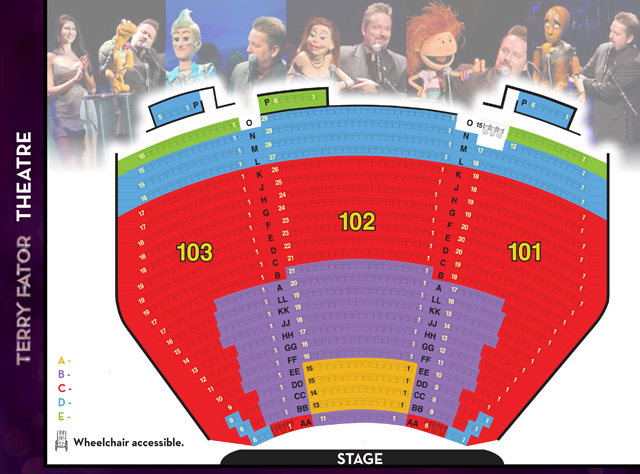 Terry Fator: The Voice of Entertainment is a one-of-a-kind experience that features a mix of singing, comedy, spot-on celebrity impressions and a cast of unforgettable characters. The “America’s Got Talent” winner showcases his versatility as an entertainer through his dynamic puppet friends, including Winston the Impersonating Turtle, Vikki the Cougar, Wreck the Crash Test Dummy and Rusty the Robot. The characters come to life through Fator’s incomparable ventriloquism and seamless interactions that are so smooth you will forget they are actually just puppets. Vegas the App’s low-priced Las Vegas Terry Fator: The Voice of Entertainment tickets are appropriate for the whole family. With hilarious comedic banter and backed by a live band, Fator and his co-stars deliver spot-on singing impersonations of some of music’s biggest names, including Cher, Garth Brooks, Marvin Gaye, Aretha Franklin and the Bee Gees. And unlike many other Las Vegas productions, Fator encourages the audience to take pictures during the show. Get your discounted Las Vegas Terry Fator: The Voice of Entertainment tickets today to see why Simon Cowell called Terry Fator one of the "two most talented people on the planet." Photographs are allowed during the Terry Fator show! Feel free to snap a few photos to remember the experience. All seating is assigned as next best available in the section.